(Beyond Pesticides, May 22, 2018) A staggering 209 million pounds of pesticides were used in California in 2016, according to the latest data released by the Department of Pesticide Regulation (DPR). This figure refers only to applied “active” pesticide ingredients and not “inerts,” which often account for 80 to 99 percent of pesticide products and can be equally hazardous to human health and the environment. Even though pesticide use in the state has dropped by 1.4 percent from the previous year, pesticide use in 2016 was still the third highest in recorded history, since the inception of DPR’s comprehensive data collection program in 1990. In fact, the total pesticide use was only six million pounds shy of the highest amount ever recorded – 215 million pounds in 1998. The land area treated with carcinogens is as large as the size of New Jersey and Connecticut combined. Nearly 102 million cumulative acres of land were treated with pesticides in the state, ranging in toxicity from low to high risk. Each time an acre is pesticide-treated in a given year, DPR adds the acre to its cumulative list, even if the treatment is repeated on the same land. The 2016 figure represents an increase of 4.3 million treated acres (4.4 percent) over 2015. What is the most troubling about these data is the fact that pesticides on either California’s Prop 65 list or EPA’s list of chemical carcinogens were applied to more than nine million cumulative acres in the state. This is equivalent to spreading the most hazardous pesticides ever produced on a swath of land the size of New Jersey and Connecticut combined. Chief among the most widely used and carcinogenic pesticides listed in DPR’s report is the herbicide glyphosate, and the soil fumigants 1,3-dichloropropene and metam-potassium. While California’s pesticide use has been increasing over the past ten years from 172 million pounds in 2007, DPR consistently downplays the community, worker, and environmental impacts of such enormous pesticide applications, year after year. In its report summary, DPR states that the continued use of such a high volume of pesticide reflects a move by farmers to apply lower-risk pesticides that require higher application rates to be effective. The report highlights the decrease in the developmental neurotoxin, chlorpyrifos, to below 1 million pounds, as a case in point. Yet, that number still represents a huge environmental release of an extremely toxic pesticide known for its harmful effects on the brain development of children in utero and the developmental functions of children into adulthood. Due to these and other serious health concerns, chlorpyrifos was on track to be banned nationwide until EPA Director, Scott Pruitt, intervened to stop it in February. This past month, the Hawaiian state legislature banned its use in response to widespread public pressure. Several other states are considering a ban and California, as the country’s biggest agriculture producer and pesticide user, should be one of them. California’s Food and Agricultural Code requires DPR to use the data it collects to establish priorities for protecting public health, farmworkers, and rural communities, among other things. To that end, DPR’s analysis of pesticide use near schools indicates that children are experiencing unacceptably high exposure levels, due to the close proximity of farms to school yards. In response, DPR ruled in 2017 that farmers must refrain from applying pesticides within a quarter mile of K-12 schools and registered daycare centers when they are in session, from 6am to 6pm. While this represents an important change in pesticides practices, it does not eliminate pesticide spraying near schools altogether. Spraying can simply be done after hours and on weekends when community events could also be taking place. 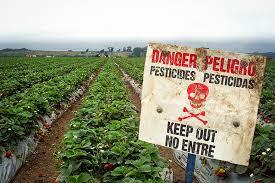 Much more aggressive actions are needed to prevent pesticide exposures, including banning the most hazardous chemicals. In February of this year, USDA released its 2016 Pesticide Data Program (PDP) Annual Summary, which documents its pesticide residue testing of over 10,000 samples of a wide variety of domestic and imported food. While the report notes that “99.5 percent of the samples tested had pesticide residues well below benchmark levels established by EPA,” it concludes that 78 percent of the samples contain some amount of pesticide residue. Public health advocates say that this large percentage is cause for grave concern as pesticides accumulate in food, air and water. EPA establishes legal limits or tolerances for a pesticide chemical residue in or on a food that it deems “with a reasonable certainty that no harm will result from aggregate exposure to the pesticide chemical residue, including all anticipated dietary exposures and all other exposures for which there is reliable information.” The “no harm” standard is based on risk assessments establishing acceptable levels of risk. While calculating acceptable exposure by aggregating exposure pathways from food, drinking water, and residential settings, EPA does not, by law, include in its aggregate risk assessment occupational exposures such as agriculture, which is by far the greatest exposure pathway. Beyond Pesticides has been critical of the manner in which EPA sets pesticide tolerance residues in food because of its wholly deficient review of the associated adverse effects. Many chemicals that account for a significant amount of dietary exposure and risk, such as organophosphate insecticides, carbamate insecticides and toxic soil fungicides in particular have yet to be assessed. For decades, Beyond Pesticides has challenged the need for the extensive use of highly toxic, carcinogenic, ecosystem-depleting, and endocrine disrupting pesticides in agriculture. Instead, it has advocated that the government prioritize aiding farmers in the transition to organic agriculture. You can learn about alternatives to toxic pesticide and herbicide use in your home and garden by consulting Beyond Pesticides’ The Safer Choice webpage. There you can obtain information about non-toxic product choices for your home and school, ideas for eating organically and affordably, and how you can organize to make your community a pesticide-free zone. This entry was posted on Tuesday, May 22nd, 2018 at 12:00 am	and is filed under Agriculture, California, Children/Schools, Chlorpyrifos, Environmental Protection Agency (EPA), Glyphosate, Metam Sodium, Uncategorized, US Department of Agriculture (USDA). You can follow any responses to this entry through the RSS 2.0 feed. You can skip to the end and leave a response. Pinging is currently not allowed.